WMV, short for Windows Media Video, is widely compatible with Windows PCs. And it is the name of the video encoder that was created by software giant Microsoft. The advantage of WMV is good compression and quality. WMV has been such a popular video format and perhaps you have lots of homemade or downloaded video files in WMV fomat. Want to burn them to DVD so that you can watch them on your TV or home DVD player? Consider it done! In this article, you will learn how to burn WMV to DVD on Mac, Windows (including Windows 10) with ease. To convert WMV files to DVD, you need a DVD burner. Aimersoft DVD Creator is one of the best DVD burning programs that lets you convert and burn DVDs from WMV video with the original video quality and fast burning speed. In addition, the built-in video editor and free DVD menu templates enables you to take your DVD to the next level instantly. If you are using a Mac, just turn to Aimersoft DVD Burner Mac, which allows you to copy WMV to DVD on Mac OS X (including El Capitan). Now download the program and check it out on how to convert and burn Windows Media Video to DVD. The guide below is divided into two parts to show you how to convert WMV video to DVD format on Mac and Windows separately. Just make sure you've downloaded the right version. Find the WMV video you want to burn and drag them into the source pane. You can also import media files from iPhoto, iMovie, iTunes, etc. directly with one simple click. If needed, you can customize the videos to get better visual effects. 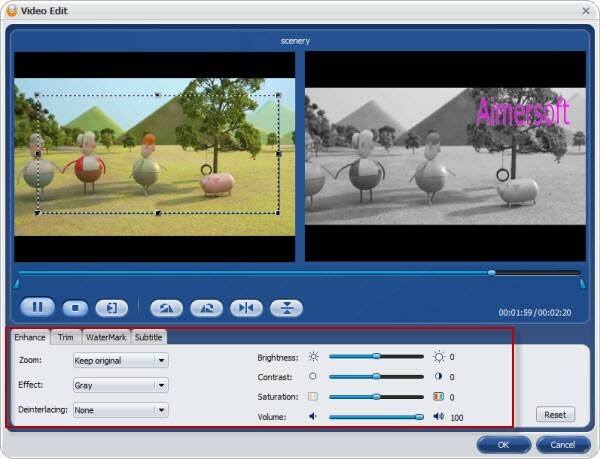 The supported editing functions include: trim the video into small segments, crop the video frame size or add watermarks and subtitles and more. This program supports creating personalized DVD menu. Click Burn to start converting your WMV movie to DVD on Mac (Mountain Lion). Once the burning process is done, you can view them on your DVD player with ease. Here is the video tutorial on converting WMV video files to DVD on Mac. Click the "Import" button to select and add the WMV videos into this program and organize the DVD titles and video sequence. All loaded videos can be previewed in the right preview window and you are free to take snapshots of your favorite movies scenes. The built-in video editor lets you personalize and touch up your media files in clicks. Video editing functions like Trim, Crop, Rotate, Add Watermarks, etc. are provided. Simply click the Edit button located beside each video clip to open the video editing window to edit your videos. If you like, you can choose a DVD menu template under "Menu" and customize it with your favorite buttons, frames, photos, music, etc. When all is OK, insert a writable DVD disc into your computer's DVD-ROM and go to "Burn" tab to start burning your video to DVD. After that, you can play WMV on DVD player with ease.